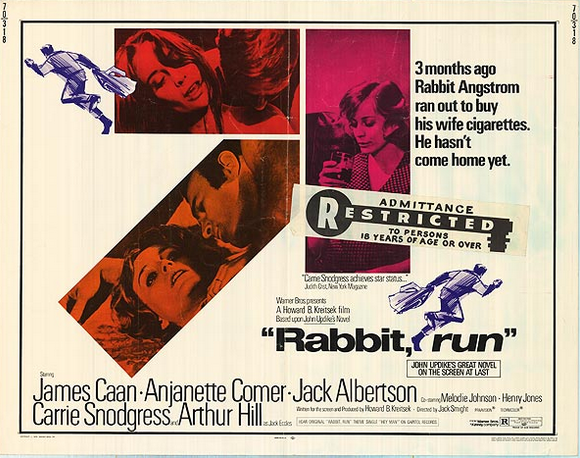 Updike fans know that James Caan starred in a film version of Rabbit, Run that premiered in Reading and was so unwarmly received that the studio decided against a wider release. And Updike fans know that the film is rarely shown. But who knew it was lost? And now found? In “TCM Unearths the 1970 movie version of John Updike’s Rabbit, Run,” freelance journalist Shaw Conner cites a 2007 Reading Eagle story you may have missed. That article reported that “Rabbit, Run may have been lost forever if it wasn’t for Ray Dennis Steckler. Steckler, who made a name for himself in the ’70s for adult films such as Sexual Satanic Awareness and Red Heat (he also made the rather fabulously titled 1964 cheapie The Incredibly Strange Creatures Who Stopped Living and Became Mixed-Up Zombies), bought a 16mm print of the film for $1000 after seeing an ad for it in a magazine. Originally from Reading himself, Steckler wanted a little piece of home. He later gave the print to the organizer of a film festival in Berks County (a county in Pennsylvania that includes Reading).That print ended up at the Historical Society of Berks County. This entry was posted in Films & Performances, Lost & Found, Updike in Context. Bookmark the permalink.